On today’s show, recorded in July, 2018, I give my thoughts on what the bankruptcy of Tesla Inc., the electric car company, can teach us about how we manage our own personal finances. 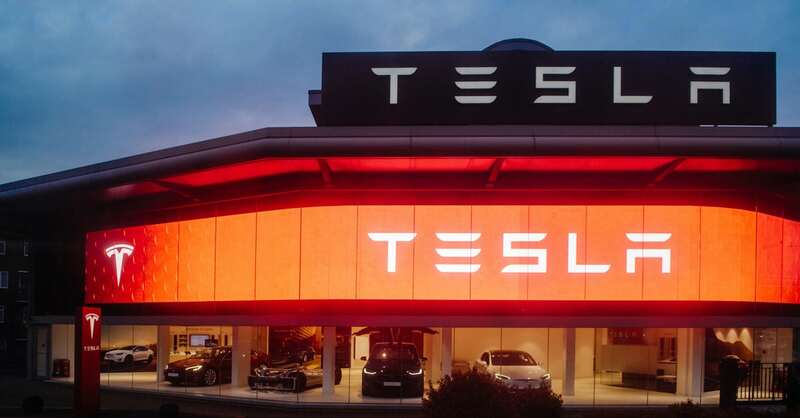 And yes, I realize that Tesla is not (yet) bankrupt, and in fact they have a market value of approximately $50 billion (in US Dollars), which is comparable to the market value of General Motors, so on the surface it appears that everything is going great at Tesla. But is it? 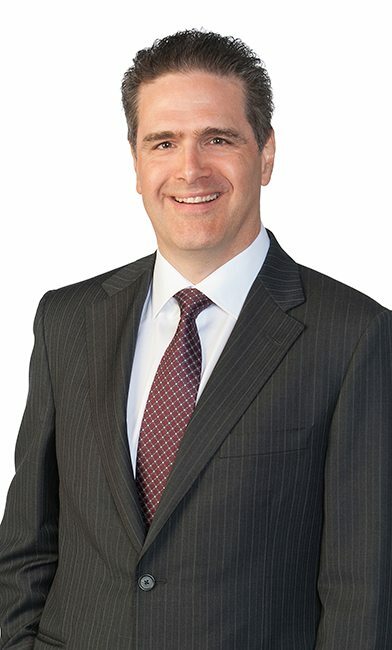 When I use my skills as a chartered accountant and Licensed Insolvency Trustee to analyze Tesla’s financial results, I see the same warning signs that I see with my clients just before they file bankruptcy. What are the warning signs? On today’s show, I explain what Tesla’s current financial problems can teach you about your own personal finances, and I describe four warning signs that are common to both Tesla and people with debt. Is someone who drives a new car successful? Perhaps, or perhaps they are leasing it, and can’t afford the lease payments. Outward appearances do not tell the entire story. Looks can be deceiving. For the three months ending March 31, 2018, Tesla’s cash flow from operations was negative $400 million. You might be wondering how they can stay in business when they’re losing money. Well, they’re doing the same thing I’ve seen my clients do when they’re short on cash: tap into their savings, and when their savings run out, they use debt. That’s what it means to have a negative cash flow – your costs are higher than the money you have to pay them, so you borrow or sell assets to make up the difference. Is this a sustainable way of running a business or personal finances? No. For the time being, Tesla can continue to live off its cash on hand, but the cash won’t last forever. They either need to sell more cars (at a profit) or sell more shares, or borrow more money. You can apply for another credit card or cash in your RRSP. But if you don’t fix the underlying problem, it’s only a matter of time before bankruptcy or a consumer proposal becomes a viable option. If you realize you’re facing a similar scenario seek help. By restructuring your finances early, you leave yourself with more options than bankruptcy to get relief. A “current ratio” is the ratio of current assets to current liabilities. In other words, it’s funds you have access to in the short term to meet payments that come due in the near future. Ideally, you want to have as high a current ratio as possible. For example, if your rent due tomorrow is $1,000 and you have $1,000 in the bank, your current ratio is 1:1. While that’s OK, you want to be able to have some money left over to save and meet other emergencies. It’s better to owe $1,000, but have $2,000 available in the bank for a ratio of 2:1. With negative cash-flow, it’s no surprise that as of the end of March 2018, Tesla’s current ratio was 0.86:1. The company had $6.57 billion dollars of current assets, but $7.67 billion dollars in current liabilities to pay. Again, this is not a good picture. At a personal level, if your credit card payment is $1,000, but you only have $860 available to pay it, you have a low current ratio and should consider reviewing your finances with a professional before it’s too late. While it’s clear that Tesla’s finances are in trouble, the company isn’t giving up without a fight. Since it costs a lot of money and time to build a factory to manufacture cars, Tesla has opted to meet production deadlines by building cars in a tent. It’s cheaper and it saves time. I’ve seen my clients take a similar approach to maintain financial balance: they take on a second or even third job and do whatever they can to generate extra cash to avoid digging themselves deeper. The fight to stay on top is certainly admirable, but it’s not sustainable. It’s very difficult to work a 9-5 job and then work from 6 p.m. to 2 a.m for any length of time. Eventually, you get tired and can no longer keep up. The same applies to Tesla. Saving money by using a tent is a temporary solution. But it will eventually impact the quality of their cars and they will be forced to find a more permanent solution. Once again, until Tesla can actually sell more cars and turn a profit, short-term solutions won’t give them long-term success. If you find yourself having to fight by working multiple jobs to make all of your debt payments, I would recommend getting debt help. Because even though it’s working out for you now, you don’t want end up getting sick and in a worse situation. At the end of the day, it doesn’t matter if you own an expensive car or live in a bigger house, or if a company is worth $50 billion dollars if it’s not sustainable. To truly be financially successful, you have to be able to meet your expenses without relying on debt. My advice, if you have too much debt, is to reach out for help. (Sorry Elon, I only help people, not companies, so you are on your own). For a more detailed explanation of Tesla’s troubling financial picture and the lessons you can learn from it, tune in to today’s podcast or read the complete transcription below. On today’s show I want to talk about the bankruptcy of Tesla, the electric car company. I admit, that’s a show title that screams of “clickbait”, because as I record this at the end of July, 2018, Tesla is not bankrupt. Based on the average price of Tesla stock over the last month, the company is worth over $50 billion US dollars. That hardly sounds like a company in trouble. I’m a chartered accountant and a licensed insolvency trustee. I spent the first ten years of my career doing audits and corporate restructurings, so I understand what can go wrong with a company. I’ve spent the last 20 years helping individuals with debt, so I understand how people get into trouble, and when I look at Tesla, I see some scary problems. If I was a betting man, and I’m not, I would bet that Tesla will end up bankrupt, or at the very least Tesla will need to raise a lot of capital, or be taken over by another company. I don’t see how it’s possible for Tesla to continue to exist in their current form. So what are those problems, and what can they tell us about how we handle our own personal finances? First, looks can be deceiving. If you were to sit on a park bench today and observe everyone as they walked by, you would not be able to accurately guess who is having serious debt problems, and who isn’t. You may disagree with that statement. You may say that it’s obvious when someone has money problems. They wear shabby clothes, and drive an old car, so it would be easy to tell. They probably are unemployed. The average person who goes bankrupt has a job. Many of them are self-employed and run their own business. They are hard workers. You can’t tell by looking at them. Some of them drive older cars, but many of them have relatively new cars that they lease or finance. In fact, expensive financing on a car or a house is often a contributing factor to money problems, because if you spend too much on your car, you don’t have enough money left over to pay your other debts, and that causes debt problems. My point is that you can’t tell that someone has financial problems by looking at the car they drive. Looks can be deceiving. You can only tell how someone is really doing by digging deeper, and looking at all of the numbers, which of course is impossible to do if you are sitting on a park bench watching the crowds stroll by. It’s exactly the same with Tesla. If you are sitting on a park bench and see a Tesla car drive by, you say “wow, that’s a cool looking car”. The company’s value is about the same as General Motors, a company that’s been around for a lot longer than Tesla, and makes a lot more cars, but if the old GM and the upstart Tesla are worth about the same, that must mean that Tesla is doing well, right? No, because looks can be deceiving, and the only way you can start to see what’s really going on is to look at the numbers. Every person who has ever gone bankrupt or filed a consumer proposal has had negative cash flow. That’s what debt is. Your expenses are greater than your income, so you have to borrow money to make up the difference. For the three months ended March 31, 2018 Tesla’s cash flow from operations was a negative $400 million. So how are they still in business if their operations are actually losing money? Two reasons: first, they had cash on hand that they could spend, and second, they borrowed more money. This is a common story for many of my clients. I ask them what happened, and they tell me that everything was going good, they had some money in the bank, or in an RRSP, or a TFSA, and then something happened, they lost their job, or got divorced, and now they are in to see me for advice. I ask them when they lost their job, or got divorced, and they will often tell me it was a while ago. 6 months ago, a year ago, or often two or three years ago. So why didn’t they come in to see me a year ago? Because they had money in their RRSP, or other savings, and they were cashing them in and living on that. Same with Tesla. They sold shares in the company and raised cash, and it is that cash that is allowing them to fund losses. Of course as my clients discover, you can have negative cash flow for a period of time, but you can’t do it forever. Eventually, the cash runs out. When will Tesla’s cash run out? It depends on whether or not they can start turning a profit or if they can borrow or raise more capital. It’s the same discussion I have with my clients. They tell me they lost their job, so my first question is “when do you think you can find another job?” In some cases they work in a seasonal job and get laid off, but they know when they will be back to work. In other cases they are looking for a job but haven’t found anything yet. For them, they have to decide whether to hang in there and hope they find a job soon, or decide to deal with their debts now. You don’t want to go bankrupt the day before you find a new job that would have earned you enough money to pay back your debts. That’s why, with my clients, we do the math. My average client has a monthly take home pay of just under $2,400. They spend 41% of their income on housing costs, and 31% of their income on personal and living expenses, and when you add in a few other expenses that leaves them with around $300 to make their debt payments. Unfortunately, they have around $50,000 in unsecured debt, which is money they owe on credit cards, bank loans, payday loans, and taxes, and so their interest costs alone are around $960 per month. I’m giving you averages, and everyone I help is different, but you can easily see that if you have $300 available to pay your debts, but your interest costs alone are over $900 per month, you have negative cash flow and you can’t make a go of it forever. You have to do something, and that’s why my clients choose to file a bankruptcy or a consumer proposal; they have no other choice. Many of my clients don’t even realize they have negative cash flow, because they are using credit to pay their bills. They take a cash advance from their line of credit to make the minimum payment on their credit card. They use their credit card to buy gas for their car and pay for other purchases. As long as they can continue to borrow, they can survive. Once they can’t borrow, they are done. When they are maxed out on their credit cards and lines of credit, they know they need help. Before that happens, they will try to liquidate any assets they have. If they have money in an RRSP, they will consider cashing it in so they can use that money to pay their debts. Of course that only works if their assets are greater than their liabilities. If you have $50,000 in credit card debt and $5,000 in your RRSP, cashing in your RRSP won’t solve the problem. The fancy accounting term is that you have a liquidity problem. All of my clients have a liquidity problem, and guess what, so does Tesla. Over the years accountants have invented various financial ratios, to allow us to quickly analyze a company’s balance sheet. For example, there is the current ratio, which is the ratio of current assets to current liabilities. As a person, if you had $1,000 in your bank account, and your rent of $1,000 was due tomorrow, the ratio of the cash you can quickly access (the money in your bank account) to the liabilities you have to pay quickly (your rent) would be 1,000 to 1,000, or as we accountants like to say, 1 to 1. You want to have as high a current ratio as possible. That means you want to have as much current cash as possible, so that you can meet any upcoming debt payments. The most obvious current cash is actual cash, or cash in your bank account that you can access instantly. Money in a TFSA, a Tax Free Savings Account, is also a current asset, because you can get at it quickly. Money in an RRSP may also be a current asset if you are allowed to cash it in, but of course all of the money is not available, because you have to pay tax on some of it. But what about someone who has $1,000 in their bank account, but owes money on a house mortgage of $500,000? That’s a bad ratio, isn’t it? Maybe, but that’s comparing short term and long term, which is not the point of the current ratio. You’ve got 25 years to pay off your mortgage, so the amount of cash you have in your bank account today is much less important than the amount of cash you have if your rent is due tomorrow. As a person, your goal is to always have a current ratio of greater than 1 to 1. If your rent is $1,000, it’s nice to have $2,000 in the bank. That’s a current ratio of 2 to 1. The higher, the better. So what about a company? Companies don’t have TFSAs, but they have cash, and accounts receivable, and inventory, and they have bills to pay, what are typically called accounts payable. As a company, if you have $1,000 in accounts payable, you want to make sure that you have at least $1,000 in current assets, like cash or accounts receivable, so that you know you will collect enough cash in the next month to pay whatever bills are due in the next month. You want to have a current ratio of at least 1 to 1, and 2 to 1 would be better. So what is Tesla’s current ratio? As of the end of March, 2018, Tesla’s current ratio was .86 to 1. Point eight six is less than one. That’s not good. Tesla had 6.57 billion dollars of current assets, things like cash, accounts receivable and inventory, but their current liabilities were 7 point six seven billion dollars, because they had a lot of accounts payable, taxes payable, and other debts that they would have to pay very soon. So it’s just like if your minimum payments on your credit cards due tomorrow are $1,000, but you only had $860 in the bank. How can you make your payments? As a person, you may only be able to pay the credit card companies $860 and tell them that you will pay them the rest later, but that won’t make them very happy. If you short pay every month, they will eventually put you in collections, and maybe even take you to court and try to garnishee your wages. As a company, it’s also a big problem, because if you don’t pay your suppliers, they will stop supplying you, and you are out of business. So Tesla’s problem is similar to the problems my client’s have: they have negative cash flow, and they don’t have enough current assets to meet their current obligations, unless they find other sources of money. They are short many millions of dollars every month, and that can’t continue forever. I said earlier that most of my clients try very hard for a long time to make a go of it. They cash in assets, they try to find a second job, they borrow from family and friends. They don’t give up without a fight. Tesla is exactly the same. Elon Musk, the top guy at Tesla, is not giving up without a fight. Since it takes a long time to build a factory, to quickly increase production he actually built a huge tent, and they are using it to build more cars. That’s exactly like my clients doing something unconventional to stay afloat. They get a second job, or even a third part time job. They start a side business. They do whatever they can to raise extra cash. But, here’s the thing: it has to be sustainable. Long term I’ve never met anyone who can work a 9 to 5 job, and also work a 6:00 pm to 2:00 am job. You can do it for a few weeks, maybe even a few months, but eventually you get run down, you get sick, and you’re done. I don’t know how long you can build cars in a tent, and I don’t know if the quality of a car built in a tent is better or worse than a car built in a proper factory, but it may not be sustainable in the long term. The situation at Tesla is very similar to the situation that many of my clients find themselves in every day. On the surface, many of my clients appear to be doing fine. They have a job, and they drive a nice car, but under the surface, invisible to the casual observer, there are problems. They have negative cash flow. The money coming in each month isn’t enough to pay all of the bills each month. Tesla has exactly the same problem. Sometimes my clients find a higher paying job, or are able to cut their expenses, and everything works out fine. That may happen with Tesla. Tesla may start selling more cars, and with economies of scale they may start making money, and everything will work out. I doubt it, but it’s possible. Negative cash flow is a problem, but bad liquidity ratios are also a problem. If you don’t have enough current cash to pay your current debts, creditors will start screaming. That’s generally what pushes my clients over the edge and forces them to give my office a call, and that may also be the un-doing of Tesla. That’s not to say everyone rolls over without a fight. Far from it. Elon Musk will keep fighting, right to the end, as do my clients, but eventually math takes over and there is nothing more that can be done. So what’s my advice if you have negative cash flow, and more current obligations than cash? Unless you think your situation will improve quickly, it is usually better to confront the problem and ask for help. For many, a consumer proposal or personal bankruptcy is necessary for a fresh start. And what’s my advice for Elon Musk? The numbers look bad. Really bad. Unless he can raise a few billion dollars, or he can figure out a way to make a lot of cars profitably, I don’t see how Tesla can survive. Time will tell if I’m overly pessimistic. That’s our show for today, and our last new show here in Season number 4 here on Debt Free in 30. For the month of August we’ll be rebroadcasting our most popular shows from the last season, and starting in September I’ll have all new shows, and many new guests, delivered automatically to your phone or other podcast listening device every Saturday morning. A full transcript of today’s show can be found at hoyes.com, that’s hoyes.com, and I’ll include in the show notes links to Tesla’s financial statements in case you want to crunch the numbers and decide whether or not my pessimistic analysis of Tesla’s future is reasonable. 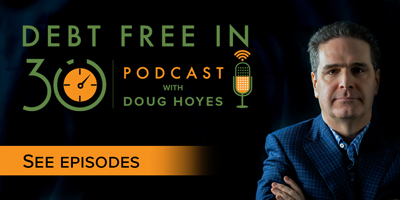 So until our rebroadcasts start next week, and until our new shows in Season 5 start in September, I’m Doug Hoyes, thanks for listening, that was Debt Free in 30.